Recently, I was checking all of the search terms that people are using to visit this Dru’s Misadventures for the 2013 Year in Review post. I had been noticing a lot of people were visiting this blog because they wanted to know about the Sobu Line. I believe a lot of people want to know about it because it is part of the JR Line that goes from Tokyo to Narita Airport. It is a very confusing line and a very cruel initiation into how to use the trains in Japan. While the number of services on the line is not that confusing if you are trying to get into Tokyo, it can be very confusing for people to go to Narita. It is even confusing for people who live in Tokyo and I have been caught out many times when trying to catch my correct train. Having lived on the Sobu Line for over 3 years now, I have learned a lot and have become a veteran of using the line at various stations. It is still not the easiest line and a bane in my side since I moved to Kinshicho. I will say that it is relatively convenient but confusing enough that I would still get lost if I am travelling a long distance on the line. The first thing to learn about the Sobu Line is to learn that there are 2 lines combined to make one. There is the Sobu Rapid and the Sobu Local. We’ll start with the Sobu Local first, but you have to realize that the Sobu Local is not really the Sobu Line; as I said, it is very confusing. It is often written as the Chuo-Sobu Line. Officially, the line runs from Ochanomizu, next to Akihabara, all the way to Chiba. During the day, trains run all the way from Nakano all the way to Chiba. From Ochanomizu to Nakano (rather past Nakano), it is officially the Chuo Local Line, and from Ochanomizu to Chiba, it is the Sobu Local Line. They even run their own colour, yellow. Late at night, sometime after 10pm, the Chuo-Sobu becomes just the Chuo Line in the west as the express Chuo Line shuts down and becomes a local line only. The trains run the local route and people have to change trains at Ochanomizu. It is a small hassle at night but not a big problem. 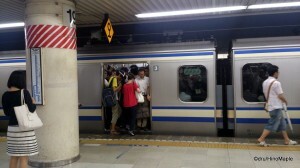 The Sobu local line is often busy and it is considered the busiest JR East train in all of Tokyo. The area between Kinshicho and Akihabara is considered the busiest section with trains running at over 100% capacity all day and over 200% capacity during the rush hour. Needless to say, it is not a fun train to take but it is a necessary train for anyone living out east. The main reason to use this part of the line is to go to Ryogoku to see the sumo stadium and the Edo Tokyo Museum. The Sobu Rapid can easily be known as being the dark blue line. 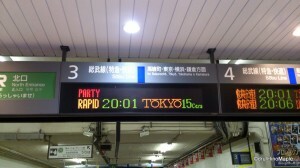 The trains skip a lot of stations between Chiba and Tokyo Station, hence the “rapid” moniker. The Sobu Line itself causes a lot of confusion for people as the local line heads from Kinshicho to Ochanomizu, whereas the Sobu Rapid heads from Kinshicho straight to Tokyo Station. This is why the Sobu Local is very busy from Kinshicho to Akihabara as all of the people taking the rapid train switch at Kinshicho and fill up the local train to get to Akihabara. The other problem with the Sobu Rapid Line is that the platforms at Tokyo Station are very deep underground. The Sobu Rapid Line was actually planned to be called the Narita Shinkansen with Shinkansen running from Tokyo Station to Narita Airport. It was never realized due to local opposition and the planned section became the Sobu Rapid Line instead. The Shinkansen was planned late, so the line is very deep underground and can take 5 minutes to get to the main part of Tokyo Station. The Sobu Rapid Line may be deep underground, and it runs less often than the Sobu Local Line, it is not as busy compared to the Sobu Local line. This leads to the trains being more comfortable in general, but not always the case. The point where the Sobu Rapid becomes blindingly confusing is the connections with other lines. The Sobu Rapid Line officially runs from Chiba to Tokyo Station with through service to the Yokosuka Line. The Yokosuka Line runs from Tokyo Station to Zushi or Kurihama. Officially, the Yokosuka Line is only from Ofuna to Kurihama, but the tracks from Tokyo to Shinagawa are exclusive to the Yokosuka Line and then shared with the Tokaido Line to at least Yokohama, but I’m not too sure where it ends. The fact that these two lines are connected creates one of the busiest train lines and longest train lines in Tokyo. You can travel on a single service train from eastern Chiba all the way to southern Kanagawa, but there really isn’t any good reason to do so. The Chiba side of the line is even more confusing. While officially the Sobu Rapid ends at Chiba, the trains often travel much farther on 5 different train lines leading to a very confusing set of destinations. For most people, Chiba will be the farthest they will go, so you don’t have to think of which train you take. 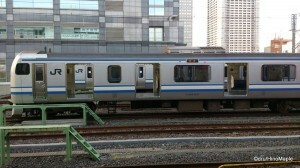 Some trains will only go as far as Tsudanuma Station, about 2 rapid stations away from Chiba. These trains are common enough that you do have to be careful, but as I said, most people don’t have to worry about it. Finally, there is a special Narita Airport service that runs once an hour and it usually departs soon after one of the Narita Express trains. For the average tourist, knowing how to get to the airport is very important. I have written about how to get to the airport in Narita to Tokyo and Narita to Tokyo (Revisited). 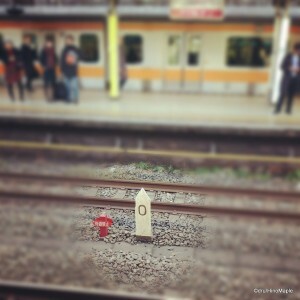 When trying to catch the correct train from Tokyo to Narita, things are pretty easy. 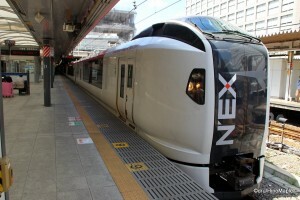 All you have to do is head down to the platforms at Tokyo Station and just look for the train heading to Narita Airport. The tricky part is finding the correct platform. The Sobu Rapid and Yokosuka Line trains have 2 platforms and the Sobu Line makes use of most of them. Most of the time, trains will be on tracks 3 and 4 but occasionally they will be on track 2. Occasionally, Yokosuka Line trains will be on track 3, but I have yet to see that. 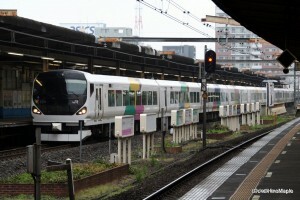 For people on the Narita Express, it is pretty easy as tracks 1 and 2 are almost never used for trains going to Narita. Only rare exceptions are made for those trains, specifically when there is a major problem. As for regular trains, you do have to be very aware of which track you are taking as often I have been caught out by a train leaving on track 2 for Chiba and I was waiting for it on the Track 3-4 platform. If you are planning to take the regular Sobu Rapid to Narita, you don’t have to worry as much as these trains also generally depart from tracks 3 and 4. For the other stations, things are very easy and you don’t have to think about it at all. You just have to make sure you are careful about which train you take and which way you are going. Otherwise, it is pretty easy. The Sobu Line is not an easy train to use at first, but it gets easier with each use. I am not a fan of the line but it is useful for many people. It is a very difficult line to understand at first, and the platforms at Tokyo Station don’t make it easy to learn either. You really have to be awake when you are taking the Sobu Rapid Line as you can easily be caught out taking the wrong train. In general, there isn’t much to think about as long as you know your destination and take a train that goes to that station. The only problem lies when you get onto the wrong train. Taking the wrong train or missing the train you intended to take can lead to huge headaches and I am well experienced in that. Taking the Sobu Rapid Line from Tokyo Station took about 6 months to get used to. I now feel confident in taking it but I am still getting caught out from time to time. Leave enough time so you don’t get caught out and you’ll have no problems catching the right train. This entry was posted in Tokyo, Trains and tagged Akihabara, Chiba, Chiba Station, Chuo Sobu, Chuo Sobu Line, japan, Kanagawa, Kinshicho, Kinshicho Station, Kurihama, Nakano, Nakano Station, Narita, Narita Airport, Ochanomizu, Ochanomizu Station, Ryogoku, Ryogoku Station, Sobu, Sobu Line, Sobu Local, Sobu Local Line, Sobu Rapid, Sobu Rapid Line, Tokaido Line, tokyo, Tokyo Station, Tsudanuma, Tsudanuma Station, Yokosuka, Yokosuka Line, Zushi by Dru. Bookmark the permalink. Ah, Tokyo’s trains, so efficient yet SO DAMN CONFUSING! I’m supposed to be a veteran commuter, and just last week I got caught in the maze that is the Keio Line. I thought I was going to Hachioji. No, it was Hashimoto. Fortunately I realized/knew I had to change at Chofu. Hehe. I know all about the Keio Line too. I have trouble going to FC Tokyo games because of it. Also the Odakyu Line is almost as difficult. Could be worse, as the Keio Line actually has 2 stations but considered the same. Just a very small corridor connecting the two. Do major sobu line stations like Tokyo station have those really long platforms that 2 different trains may be stopped at, at the same time? And you’ve gotta double check the signage to make sure you’re on the right end of the platform (ex: tobu stacia vs normal trains out of Kitasenju heading north). I find those extremely confusing but don’t spend enough time in Tokyo station other than for shinkansen so I don’t know what Tokyo station platforms are like. If you mean 2 trains on the same line, no. 2 trains using the same platform but opposite sides, yes. The only thing you do have to worry about is the Boso and other Chiba express trains that charge extra, but those trains look really different to the regular ones. Also, you have to be aware if the train is a little short. Most trains have an extra 4 cars at one end but sometimes they don’t and you end up running to the nearest car when it arrives. Also, Tokyo Station is a logical maze once you get to know it better. I’m still confused on the north side of the station trying to get to the Shinkansen/Keiyo Lines. Maps don’t help enough.